This location is indeed correct, although the various suburbs and names mentioned in connection with the smelter makes things a little confusing. The smelter was the English and Australian Copper Smelting Company, which operated until about 1917. Photograph of Waratah copper smelter by Ralph Snowball, 1906. University of Newcastle, Cultural Collections. 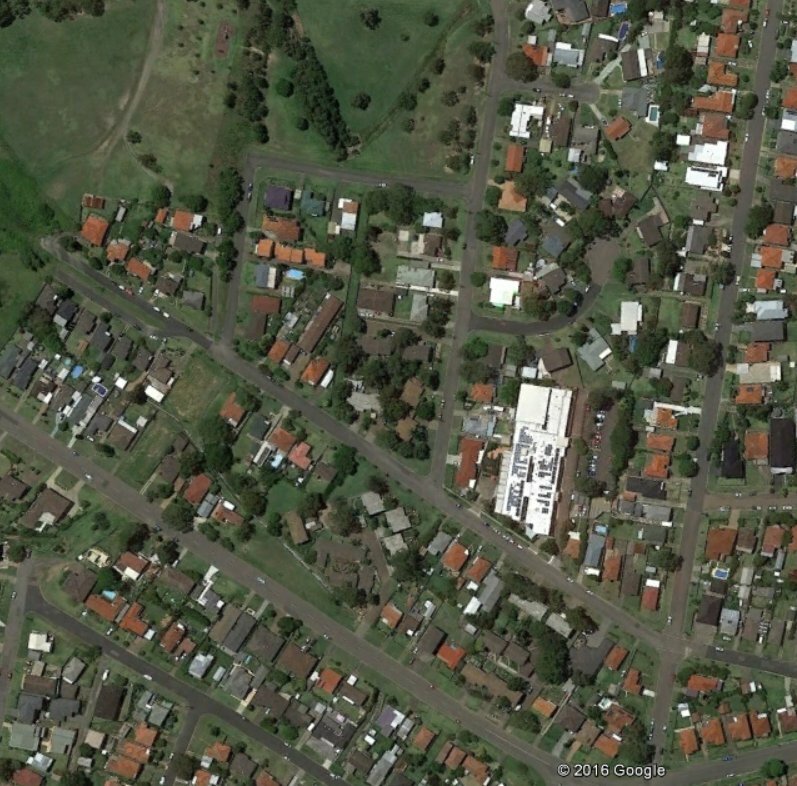 The location of the smelter is now in the modern suburb of Broadmeadow, but at the time the smelter was built, Broadmeadow wasn’t a suburb or town – it was a swamp. So the smelter was variously described as being “within a mile of New Lambton” or “near Waratah”, those being the closest townships. The association of the smelter with New Lambton was reinforced by the fact that the land the smelter was built on was the leasehold property of Messrs. J. and A. Brown, who owned the New Lambton colliery, and who had an exclusive agreement to supply coal to the smelter. For this reason the works were often referred to as “The New Lambton Copper Smelting Works”. 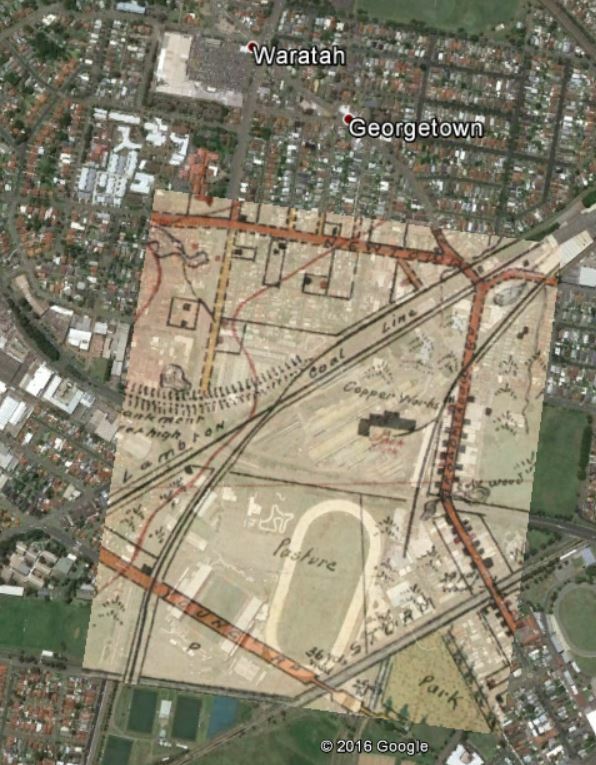 1910 Barrett map overlaid on Google Earth, showing the location of the copper smelter near Waratah. A 1906 real estate poster shows Christo Road mis-spelled as both “Christie Road” and “Christie St”. 1906 map showing Christo Road as “Christie Road”. University of Newcastle Cultural Collections. Real estate advertising that doesn’t align with reality is nothing new. The 1906 poster above shows the promise of neatly laid out roads and residential blocks in the Waratah West region near Christo, Creer and Morpeth roads. However a 1944 aerial photograph of the area I recently obtained from Newcastle Library, shows that 38 years later, there was only Christo Rd and a tiny smattering of houses in the area. 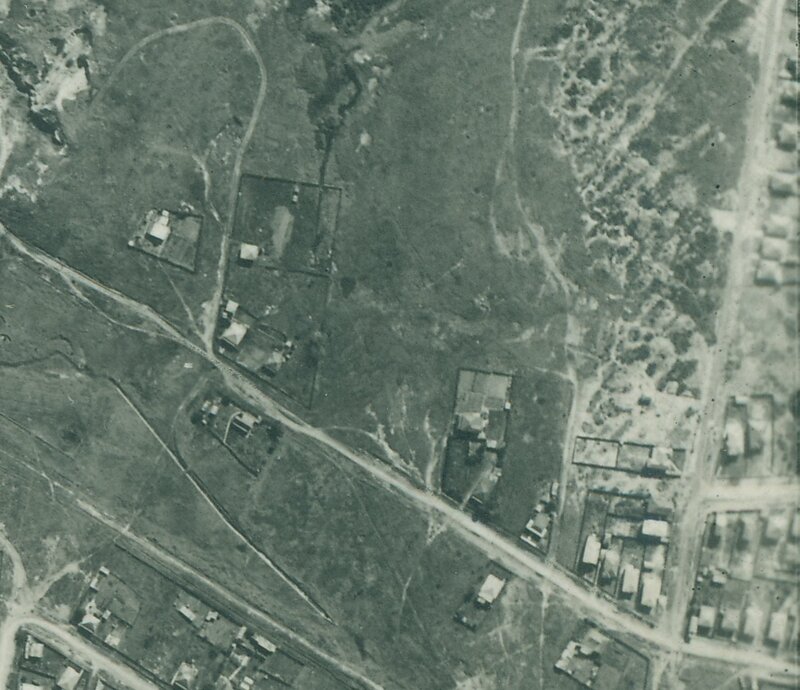 Christo Road Waratah West in September 1944. Newcastle Region Library, Local Studies. Christo Road Waratah West, 2016. Chris Weeks suggested that the smelter smoke stack can be seen in a 1906 photo from the obelisk. 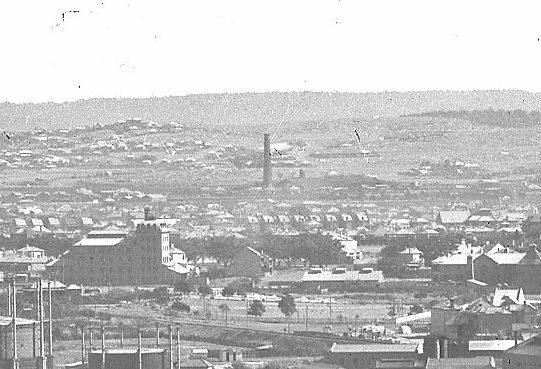 Smelter smoke stack as seen from Newcastle Obelisk, 1906. University of Newcastle, Cultural Collections. This is confirmed by drawing a line in Google Earth from the obelisk to the peak of the North Lambton hill (seen in the upper left corner of the photo portion above) and noting that the smelter stack is slightly to the right. 6 Nov 1869 "The English and Australian Copper Company, who carry on extensive smelting works in South Australia, are about to establish similar works within a mile of New Lambton. The manager is "Mr. Christoe, a gentleman of great experience in copper-smelting." 15 Sep 1870 The weather has significantly delayed the opening of the smelter. "For upwards of two months there was such an accumulation of water at the establishment as to defy the possibility of the works being proceeded with, and thus the company were unexpectedly debarred from carrying out their design in the contemplated time as regards the inauguration of the process of smelting." The manager of the smelter is Mr. Christoe. 15 Jul 1871 Advertisement for a General Manager for the New Lambton Smelting works. 6 Feb 1872 Mr Christoe supervising operations at the Burwood Copper Smelter, Glenrock lagoon. 18 May 1872 Copper ore has been received, but smelting has not yet begun. 18 Jun 1872 Lighting the first fires in two of the coppersmelting furnaces of the English and Australian Copper Smelting Company's works near Waratah. 2 Oct 1917 Smelting of ore has ceased. "The business of the company during the past year had to be conducted under conditions of great risk and anxiety, which finally forced the board reluctantly to instruct the manager in Australia to cease making purchases of ore, to smelt out all copper available, and to close the smelting works, a process that has been carried through." 6 Nov 1919 "The long connection of the English and Australian Copper Company, Limited, with the Newcastle district has been finally severed through its having recently sold the land that was the site of the works, known as the Waratah works." 8 May 1920 "The chimney stack of the old copper works, which was felled some time ago, gave about 150,000 bricks." This entry was posted in Broadmeadow (2292), Local History, New Lambton (2305), Waratah (2298) by Lachlan Wetherall. Bookmark the permalink. I wonder if the Ralph Snowball photo from 1900 is not the copper smelter on the Goninan site …. but rather the brickworks on Turton Road where the K-Mart is. I say this because the buildings in the foreground of the photo are not reflective of the structures that would have been near the Goninan site in 1900. 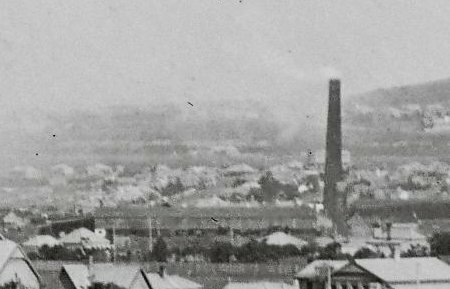 Plus I think you can see a building on a rise of ground behind the chimney … that’s the original Western Suburbs hospital building … or the Benevolent Asylum on the map you have posted. The area around the Goninan site is all flat. Hope this helps. FYI … I live in New Lambton. I know the Goninan site very well …. and I have also studied the Ralph Snowball collection closely. Did you know he lived in Clarence Street New Lambton and his house was still there in 1993. The photograph in the blog post is only a portion of a bigger photograph. If you look at the entire photograph (https://www.flickr.com/photos/uon/3238350804) then you can see that there is only one stack, and that it is not where K-Mart is today. In the photograph the Benevolent Asylum is on a rise of ground in front of the chimney. Also, the brickworks stack wasn’t built until 1913, so I am quite confident that the stack in the 1906 Snowball photo is the smelter stack. 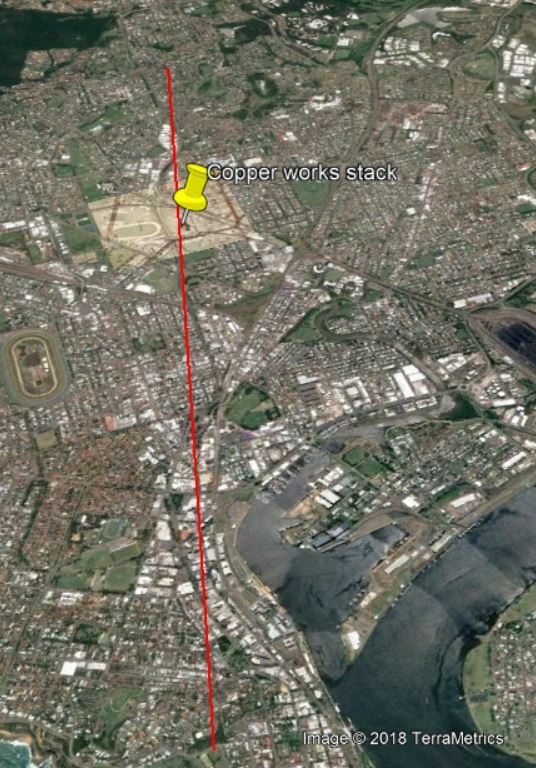 I’m fairly certain the Waratah Brickworks stack was square. K Mart waratah opened about 1970 and I recall as a youngster footage on NBN of the levelling of it. I think it may have even damaged a house in the fall.